Dani Pedrosa made an impressive debut on Bridgestone tyres in Misano yesterday, slashing nearly a second off his best race lap as rode Honda’s pneumatic valve motor too. Less than 24 hours after his shock switch from Michelin, Pedrosa spent nearly five hours on track in San Marino getting his first assessment on Bridgestone’s tyres, which he demanded after a run of poor results. 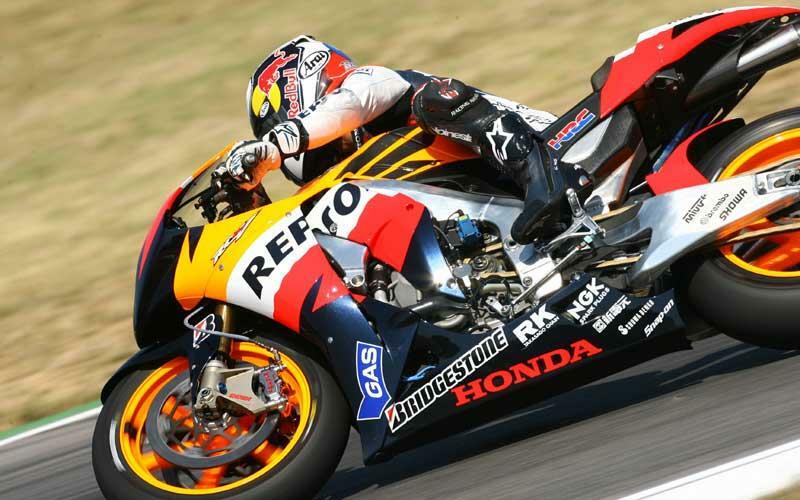 Starting the day on the conventional spring valve factory Honda RC212V, the Spaniard clocked a best time 1.35.555, which was a fraction outside of his best time of 1.35.479 that he set on his way to finishing fourth in the 28-lap Misano GP. He then made his first appearance on Honda’s pneumatic valve V4 that he last rode on the opening day of 2008 winter testing in Sepang back in January. On the revised engine spec, which team-mate Nicky Hayden has campaigned recently after he put pressure on Honda to run it in competition; Pedrosa logged an impressive best lap of 1.34.652. The triple world champion, who will make his competitive debut for Bridgestone in the Indianapolis GP on September 14, said: “I’m happy starting this new challenge and I would like to thank Bridgestone. "Today we also made an important step forward in developing the 2009 bike, but now my first priority is to be fully competitive again. Of course, there is a lot of work to do but I am determined to win again this year. "Today we worked hard on bike set-up. The feeling with the new tyres on my RC212V is different, both for settings and for riding style, but I just tried to follow my feelings and adjust the set-up accordingly. "Today was only the first day of this new challenge but I am happy. I also tested the pneumatic-valve engine. The engine character is different, the power delivery is a bit more aggressive, but the engine has some good points.